« Hell’s Bells and Hellrazor Rock Stroud! This entry was posted on February 16, 2013 at 11:14 am and is filed under 1979, films, Heavy Metal, Music, Rock, Uncategorized with tags Cat Scratch Fever, Classic Rock, Full Metal Jacket, Guitarists, hard rock, Heavy Metal, Heavy Rock, State of Shock, Ted Nugent, Weekend Warriors. You can follow any responses to this entry through the RSS 2.0 feed. You can leave a response, or trackback from your own site. Seconded. 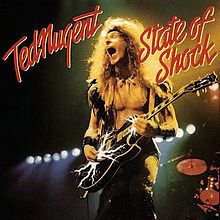 I think this is a great album of the Nuge’s. And I didn’t have any musical starvation like you did! Without comparing it to the others… if you like Ted then you’ll like this. It’s as simple as that. I really like Charlie Huhn’s voice too and Satisfied and Paralyzed are two of my favourite Nuge tracks. I agree, it is a good album. If you like this album, then you’ll like much of his other stuff too. I did not know you were at Parris Island. Thanks for sharing! Good story too. I think it is also worth mentioning that this is a simply great album cover. Seconded on the album cover. I like this one and Weekend Warriors. Yes I spent 12 wonderful weeks at P.I. back in the summer of 79. God, that sounds like a Bryan Adams song. The ammo cans I mentioned in your post didn’t come about until later in my enlistment. Weekend Warriors had a shotgun guitar didn’t it? Yep Weekend Warriors did have a shot gun guitar and 12 weeks was a long time. To make it worse, the DI’s were always threatening people they would recycle them and make them stay even longer. Yikes. Well glad you managed to graduate in 12 weeks then! And glad that Terrible Ted’s music was there to greet you on the other side! Me too, there was one recruit who was there for seven months. It was good that Ted was there but funny thing was that the first album I bought after graduating boot camp was the soundtrack to The Warriors.